Lifesize & Lifesize UK Expert Gold Partner VideoCentric, brings you the award-winning 4K Lifesize Cloud solution for wherever, whenever collaboration. Enable your teams to work smarter and drive greater communication across your workforce with simple, affordable and professional video conferencing in the cloud. Instantly call anyone you need to speak with, on whatever device you choose, and have a real-life video conference with your whole team through the click of one button. The Lifesize Cloud delivers an end-to-end cloud-based video conferencing that’s as easy, as lifelike and as remarkable as meeting in person. No other cloud-based video conferencing solution makes the collaboration experience experience so easy, accessible and frustration free for up to 300 video participants per call. And when you consider that each participant can be either an individual or an entire conference room full of people, you can see the new possibilities of the Lifesize connected experience. Lifesize offers a complete connected experience across your organisation with the Lifesize Cloud paired together with Lifesize Icon Video Conferencing systems in the meeting room. By combining both hardware and software, you get the ultimate combination of unmatched simplicity, quality video, crystal clear audio and collaborative content, and you can meet with anyone, anywhere, just like you’re in the same conference room. 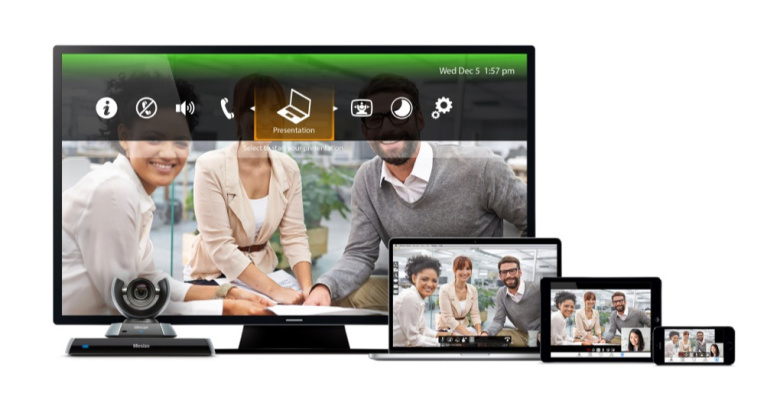 Lifesize Cloud comes preloaded on every Lifesize Icon room video system and even better, all of your devices, including your laptops, tablets, and smartphones, will update automatically whenever new features and functionality are released (every 3 weeks! ), ensuring you’ll always have the latest features to enjoy. The previous Lifesize Cloud Enterprise, Premium and Core subscriptions, and the discovery plan, are no longer available to buy. Please get in touch to discuss how this may affect your current subscription, or to find out features and pricing of the new Lifesize Cloud packages. Lifesize Cloud works like you do. Lifesize Cloud is designed for wherever, whenever collaboration. Click to call anyone you need to speak with or have a real-life video conference with your whole team just by clicking one button—instantly. Say farewell to dial-in numbers, access codes and video PINs. Simply dial people with a click of their names, and they can join your video conference on any device. Installs faster than setting up a new TV. With a Lifesize Icon video endpoint connected to Lifesize Cloud, your complete video conferencing system will be up and running in moments, not months. Just power up, connect your Lifesize solution and see everything sync automatically. Your company directory populates once users are added. No more wasting time and momentum fighting with the meeting interface. Unify people and conference rooms instantly. Unlike web conferencing and other cloud-based video conferencing services that require reserving a virtual “room,” Lifesize lets you meet whenever you want—even at a moment’s notice. No access codes, meeting invitations or room reservations needed. Add people midmeeting with just a single click. Lifesize Cloud is designed around a simplified user experience, like adding a new person midmeeting. Click the user’s name, and they’re in. Experience the most intuitive interface out there. Lifesize Cloud does everything right. Include up to 25 participants per meeting and enlarge the screen based on who is talking. Easily share documents. Use integrated chat. Ring all your connected devices at once. Get automatic software updates–and more. With Lifesize, everything is plug and play, even firewall traversal, business-class security and data encryption. Gone are the days of needing a system administrator to support every video call. We’ve built everything into Lifesize Cloud. Start your trial today with LifeSize and LifeSize Expert partner, VideoCentric. VideoCentric are the UK’s #1 Gold Video Conferencing partner of Lifesize. Our renewal rate of over 90% – customers who renew their Cloud & support services with us year on year – has been stated as “world-class” by Lifesize themselves, recognising our ability to deliver the right solutions that help you reach your business goals, and providing long term expert support that continues to deliver and prove its value, year on year.